Don’t just limit your beach foods to boxes of crackers and cookies or meat-packed sandwiches. You know these snacks have plenty of preservatives, salt and other ingredients that are not good for you. Take along some water or iced green tea, and these yummy healthy snacks and you will look great and feel great too! Moreover, consuming fresh foods on the beach is actually refreshing. Check out a few healthy snacks you can take to the beach! Healthy snack bars are one of the best snacks for the beach. They contain raw ingredients that are good for you, and they are heat-stable, of course, if you don’t leave them lying out in the sun for the whole day. Just put some healthy bars in your bag and you are ready to go. Pineapple is one of my favorite healthy snacks for the beach! It’s highly energizing from Vitamin C and natural sugars, as well as fiber, and it’s so tummy-friendly! Pineapples contain powerful enzymes that can help your digestion, keep your tummy flat and beat bloating. Before you go out onto the beach just chop some pineapples, put them in some plastic container and add a bit ginger that also has healthy benefits. Plus, pineapple is a great convenience food to store. Everybody likes strawberries, right? 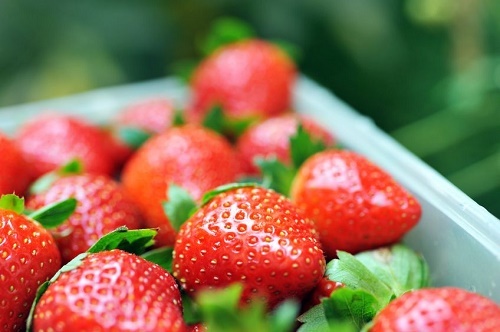 Strawberries are low sugar berries to eat. They are packed with Vitamin C that is a great antioxidant. They also contain fiber to keep your blood sugar stable and keep you full. Strawberries are fun and healthy to eat and so easy to take along to the beach. I like eating raw carrots when I want something nutritious and sweet. Snacking on only one cup can not only fill you up, but also prevent your body from harmful free radicals and nourish your body with beta-carotene that will make your skin glow. Carrots make amazing snacks when eaten alone or with some peanut butter or almond butter. Chop some carrots and put them into baggies to carry out on the beach. Another perfect beach snack is red bell peppers. They are crunchy, crisp, hydrating and sweet. Cut one red bell pepper into slices and eat anytime you want something sweet. They’re perfect for your weight and skin too. They contain fiber and Vitamin C, and are filled with water to keep you hydrated. Filled with protein, magnesium, Vitamin E and B, raw almonds are also great for the beach. Magnesium is good for a sour mood, cramps and preventing headaches. Vitamin E protects your skin, healthy fats and protein in almonds keep your blood sugar stable, and Vitamin B energizes you and helps your metabolism. Make sure you eat almonds unsalted and raw to avoid bloating from roasted nuts and salt. Tuna has no carbs, only 1 gram of fat, is packed with protein, Omega 3s, lean protein and B vitamins. Low sodium tuna will make you full for a longer period of time, and that means you can lay on the beach all day! It’s hard to spend hours at the beach without at least one hearty meal. Sure, fruits and veggies are great, but homemade muffins are better, especially when you feel super hungry. Look for wholegrain, gluten-free and low-calorie recipes, and you’ll stick to your healthy eating plan even on the beach. Popcorn is one of the healthiest snacks for the beach that will curb your cravings in a jiff! Popcorn is high in fiber and low in calories, of course, when you don’t use too much butter, salt, and bad oils. Making your own diet-friendly popcorn at home is a great way to eat healthy at the beach without worrying about your waistline. Snack mix is a quick and easy beach snack that you can make in a moment. Just mix a handful of dried fruit, some nuts and a bit of seeds, and your own snack mix is ready! This snack is healthy and cheap – you may find all the ingredients you need at home. What are your healthy snacks for the beach? Share your ideas, please!